Medu Vadai | My Cooking Diaries "CooklikeCecilia.com"
Pick and wash the urad dal in water and soak for couple of hours or overnight. Put the dal in a blender and make a fluffly paste adding a little water at a time (about 1/2 cup in all). Dissolve asafoetida in 1 tsp. of water. Wash and cut the curry leaves roughly. Transfer ground dal paste to a bowl, add pepper, asafoetida, salt and curry leaves, mix well. Heat oil in a Kadhai, moisten a spatula or steak-turner, place 2 portions of the batter at a time on it, flatten into a round shape (approx 2-inch dia) with a moist hand, make a doughnut-like hole with the index finger and invert the spatula deftly over the kadhai. 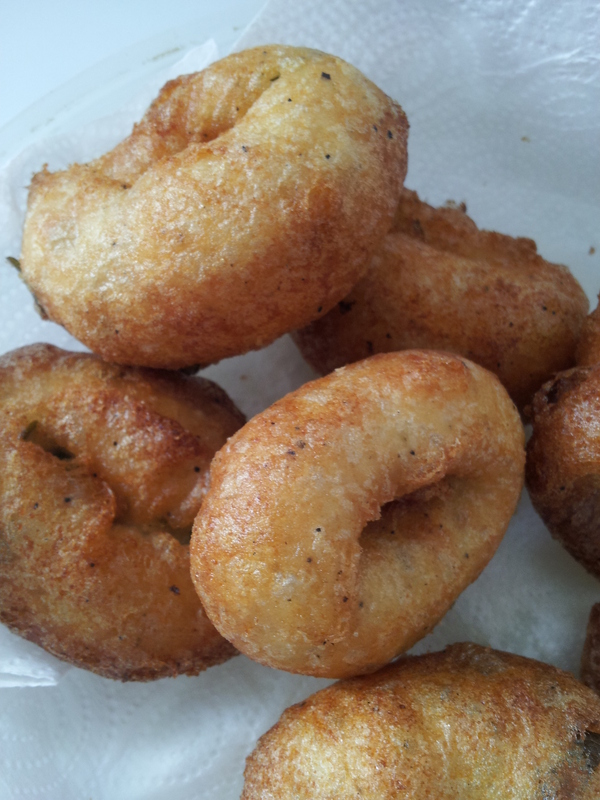 Alternately, use a medu vada maker, fill the cylinder with the batter and press into the oil, as shown. Deep fry over medium heat until light golden. Remove, keep aside for 2 minutes, return to the kadhai (optional) and deep fry until crisp and golden brown.